Consistency plays a key role in any success. Applying rules consistently takes determination and effort, but it pays off in the long term. It helps the child form and build her own learning schemes in a structured way. Consistency doesn’t leave room for confusion. It is an excellent way to model conformity and discipline. If a child is consistently rewarded every time she achieves a goal, this desired behavior will be encouraged and over time it will become a habit. Similarly, if a child consistently faces negative consequences for not meeting expectations or for not conforming to the rules, the unwanted behavior will be discouraged and will eventually fade out and hopefully stop. That means that reinforcements and consequences should be consistently applied. Problems arise when school and home don’t agree on this principle. At home if the child is allowed to play and is not asked to tidy up after she is done playing, she will probably challenge the authorities at school in regards to cleaning up, and that would become a general concept. Again, one could not emphasize enough the importance of communication between home and school in order to stay consistent. Both should support each other and work toward the same goal. There are some tips to help the children be consistent. These tips can be used at school as well as at home. At home, parents can have these rules and icons everywhere: in the kitchen, bedroom, bathroom and so on. When the child’s environment is well organized, that will help her structure her own mind too. Any discipline can be achieved by systematizing the rules. Most kids depend on their sight/vision, therefore use the icons and symbols generously. Over time they will acquire the habits, and will become more organized in their minds. It is very important for the educators to be consistent with all the kids. If the rule is applied on Jack consistently, it should be applied on Peter and Paul consistently too. No double-standards! At home as well, siblings should be treated equally. Consistency brings order where it is applied. Consequently, it saves time, energy and brings along peace of mind. Having a daily schedule is a great tool to organize things and minds. Moreover, checking the schedule consistently throughout the day keeps the child on track. 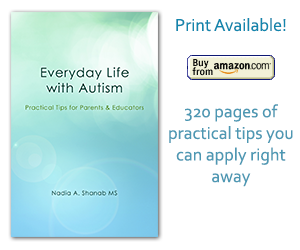 Finally, consistency sets up expectations and helps the child remain calm and relaxed. Notice that all children, and in particular children with special needs, like to know and see their boundaries. So, make sure to be clear on this. I worked with two very different autistic adults for just over a year. I cannot stress enough how important consistency is in their daily routine. When expectations are made and followed, behavioral problems will eventually decrease. However, I do prefer positive reinforcements to consequences or punishments. I agree with you 100%. Thank you so much for your feedback! I appreciate sharing knowlege and experiences. I am incredibly pleased to see that there’s still some good content to find out there. I have gotten used to google sending me garbage. I am very happy you found this site useful! Your comment keeps me going! Thank you so much, you are most welcome to visit my blog. Janet I don’t know if you understand how much I LOVE these contemms! It does my heart well to hear this going into a new school year. I teach in a big public school district outside of Philadelphia, PA. I teach a class for kids with Autism, and we work on making them as successful as each of them can be in the regular education classrooms really working individually with each student so they can grow and learn! I LOVE my students with all of my heart, and they’re the reason I put in the long hours for little pay! And hearing sweet things from people like you just reinforce what I already know. These kids are amazing and they have so many gifts to share with the world. I just pray that people are ready to see those gifts without seeing what they think is a disability first. May you always find the energy to keep up the incredible mission.